Timing is everything (at least sometimes) and while it might be argued that we arrived in Peru at an unfortunate time, right on the heels of the worst flooding in a dozen years or more, it could also be argued that we arrived precisely at the best of moments. It was, after all, the first part of February. What was significant about the timing? Among other things, it was significant because Peruvians celebrate the Fiesta de la Virgen de la Candelaria during the first two weeks of February. And nowhere in Peru is this festival a bigger deal than in Puno. 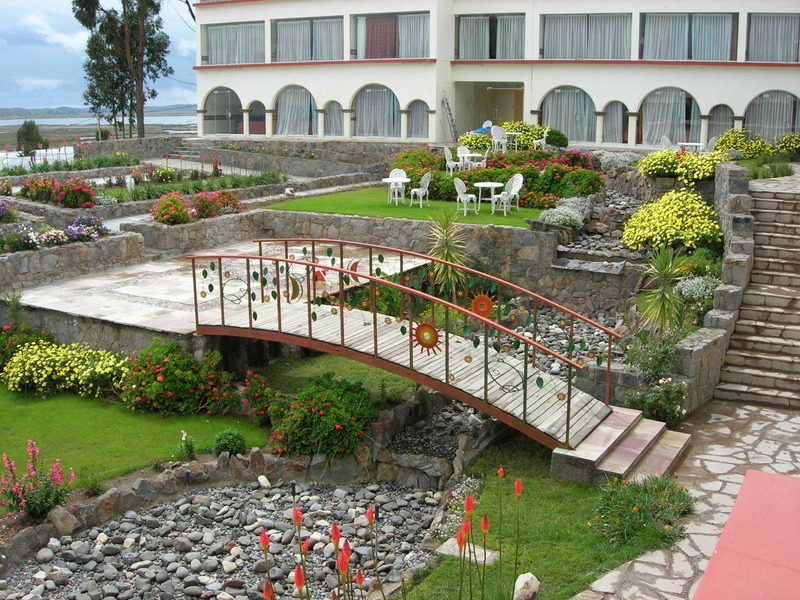 And we would be passing through Puno on our way to Chucuito, where we would be staying at the Taypikala Hotel. You see, the Virgin de la Candelaria is the patron saint of Puno and Puno is the folkoloric center of Peru. In other words, if one wanted a quick emersion (akin to jumping into the Boulder Reservoir on January 1) into Peruvian culture, being dropped into the center of Puno during the first part of February would do it. And that is exactly what happened. We were collected at the Juliaca Airport by one of Jorge Luis Delgado’s guides, who decided it would be a great thing for us to experience the festival first-hand. Forget jet lag, long layovers, and sleep deprivation. How could we forego such an opportunity? In fact, none of us wanted to forego it. We really had no idea what we were signing up for, but our guide promised to get Jorge Luis’ permission to make an unscheduled stop in Puno to see the parade. One cell phone call later, permission had been granted and another cell phone call forged the plan. We were cautioned to be careful. Pickpockets abounded during the festival and foreigners were easy prey. Our guide had spoken to a friend of his who just happened to live in Puno on the parade route. So the plan was for us to leave the bus under the care of our driver and go as a group to the home of our patron. Once there, we would pass through his house, entering through a back door and exiting through a front door—and right out onto the street where the parade was already in full swing. But what in the world was this festival about? The festival is a lovely melding of native and Catholic tradition, honoring both Mary and Pachamama. It is held during the first two weeks of February and there are celebrations on a daily basis during this time. The festival includes religious ceremonies, dancing contests, parades, and feasts. There are at least a couple of legends that place the Virgin on the shores of Lake Titicaca. She is known as the Virgin of Candelaria or Mamacha Candelaria and became the patroness of Puno where, historically, it is said that she saved the city when it was under siege by Tupac Amaru II in 1781. Puno was controlled by the Spanish at the time. The people of Puno decided to take a statue of the Virgin Mary (the Spanish had brought their religion with them) on a procession through the city’s streets, complete with candles and musicians, probably as a way of beseeching her for help in the matter.Tupac’s warriors left and the reason for their leaving is a bit obscure. The Virgin may have done the job for the people of Puno. In any event, the city seems to have been celebrating on a yearly basis ever since. Thousands of dancers and musicians parade through the city during this celebration and we were to be witnesses to it. Once in Puno, we filed down the street like a group of kindergarteners on a field trip. We were greeted by our host at his door and led through the house. And when we passed through the front door . . . we entered another world. The street was packed with people, some sitting in lawn chairs, others standing hunched together, and still others just sitting on the pavement. We had been told we could wander down the street for a block or so if we wanted, but most of us were too stunned by the spectacle to do anything other than stay pretty much where we were. Anyone armed with a camera pulled it out and began snapping pictures with approximately the same glee as the dancers and musicians in the procession were displaying. And there was plenty to photograph. My own camera was in my carry-on, buried under other luggage on the bus. I knew I’d never get to it, so I resigned myself to seeing the procession without photographing it. It might have been the better way to go because it was in-your-face palpably present. Mardi Gras in the US has nothing on Candelaria! The dancers and musicians had vibrantly colored costumes that in any other context would be thought of as garish. The older women—the grandmothers—danced through the procession with grace and enough vigor to tip us all off to the fact that this is not a country of slackers. These people are fit—even those who are carrying both age and pounds. They swung their skirts back and forth as they moved in a display that was both feminine enticement and feminine power. They swung their colorful fringed shawls along with their skirts and somehow managed to keep their traditional bowler hats on their heads. The young women wore mini-dresses and boots with thick platform soles that were reminiscent of the 1970s (or Adam Lambert). The musicians were a riot of color and sound. Among the dancers were those in Diablada (devil) costumes and they were gruesomely riveting. These were offset by dancers in stylized armor, the two groups symbolizing the battle between the Archangel Michael and the devil’s army. It is customary for the dancers to have buckets of water thrown at them (ostensibly to cool them off) and the old custom has been enhanced or added to with the practice of foam fights. That is, some parade watchers lurk with cans of foam and splash parade participants and other observers alike in good natured play. We had but thirty minutes to enjoy the festivities. It was enough. The parade had been in full swing by the time we arrived and was winding down by the time thirty minutes had passed. We piled back onto the bus, made our way through the Puno revelers, and drove for a time along the shores of Lake Titicaca. It was dark by then, so the lake was but a dark presence. Once at the hotel, we received our room assignments and dragged our weary bodies to them. I was surprised when I opened the door to my room. While I’d had no expectation about the accommodations, I suppose I had been thinking along the lines of a budget motel in the U.S., which is how rooms outside the U.S. often struck me. Instead, I found a room that was beautifully appointed. I walked over to the window, looked out, and gasped, “Holy >#*! !” I was looking down onto a beautiful garden courtyard, well lit by soft lights. There were flowers everywhere, a foot bridge, wrought iron tables and chairs . . . and the roof of the wing across from me was planted as a flower garden. Beyond that, I could just make out the lake. I hadn’t just come home—I was in heaven.